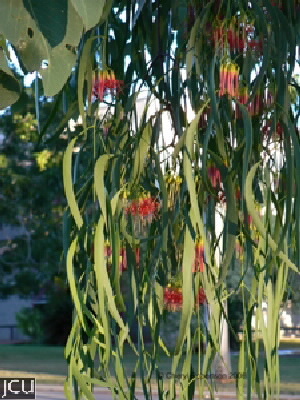 This parasitic epiphyte is found chiefly on various gum trees and occasionally on Acacia. It lacks epicortical runners, unlike a similar mistletoe A. sanguinea. It is easily recognised by the narrow, red flowers, that are straight rather than being curved as in some other genera, the usually 5 petals are free from one another.